What happens when you take a traditional granny stripe pattern and switch up the colors? Like one of those magic eye posters from the 90s, I squinted a bit, and saw triangles where there were stripes. The end result is this Love Triangles Granny Stripe Baby Blanket that was gifted recently to a friend and her soon to be baby boy. 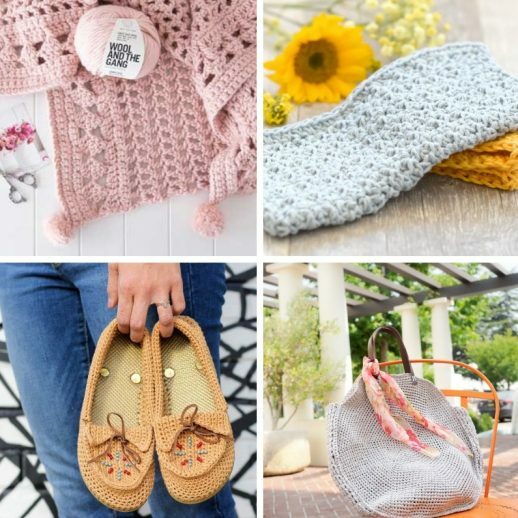 When Michele from Stitch and Hustle approached me and asked if I’d like to join her in a Granny blog hop in September, I knew the month was already going to be a doozy. With a huge fall announcement at work, and a couple high profile events to manage, I knew my blog work was going to suffer, but how can I resist playing along with some of my favorite makers? 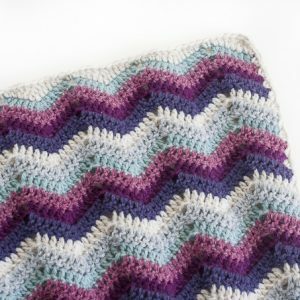 This granny stripe baby blanket is made in collaboration with Lion Brand Yarn, and uses Vanna’s Choice worsted weight yarn, my go-to choice for bright colors and easy durability. Lion Brand is doing more than just sponsoring my granny creation; they have generously supported all of our granny projects, and even more, have offered to send 1 lucky winner all the yarn needed to make all 6 projects! Holy cow, that is one big box full of happiness coming someone’s way! To enter, scroll down to the Rafflecopter entry form below. So, the story. You know I like to make whatever I like to make, and it always helps when a project is functional in addition to being beautiful and modern. I always ask myself if this is something that I would wear, or use, or buy. And the same goes for items I give away – is this something the recipient will use and will it fit in with their lifestyle? My friend had showed me her nursery ideas and her neutral color choices, and I thought back to a blanket that had caught my eye a while back (from Yarning Made on Etsy*, but no longer available). I loved the triangle motif with blocks of rich colors, and I wondered if it was possible to make triangles out of granny stripes, since if you look closely, each granny stitch is offset from the one below, creating a natural triangle effect. A traditional granny square is 4 triangles meeting point to point, see my granny square top for a prime example! And that’s all this baby blanket really is, just row after row of granny stitches. 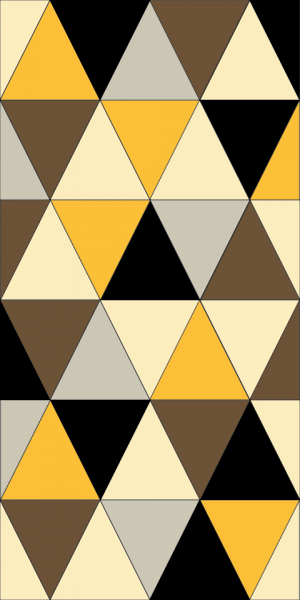 By changing colors at the right time, you build triangles instead of stripes. You can use any color combination you want, in any worsted weight yarn you choose, so you can take this basic design and adapt it for any child’s favorite colors! The blanket starts off with a row of foundation double crochet stitches. You can use that, or you can start with a row of chain stitches and work double crochet stitches into the chain. Once you finish, you end the blanket with another row of double crochet stitches. I chose not to add any other edging to the blanket, mostly because I liked the semi-raw look of the triangles going right to the edge. Or course, you can add your own border as you see fit. On the first granny row, work granny stitches (3 dc clusters) into every 3rd stitch. The one thing here to note is that while you skip stitches, you do not work any chains in between the 3 dc clusters. I wanted to minimize the size of the holes left in the granny stripe, so I went from one dc cluster to right into the next. For all subsequent rows, work dc clusters back to back, each into the space created from the clusters in the previous row. If you have 2 skeins of any one color, you can use both of them at the same time when there are 2 triangles of the same color. Pop all the skeins onto your Modular Bobbin Holder to keep all the colors in the right order. But sometimes, there are 3 triangles or half-triangles in a block, and then you’ll need to make some bobbins. I crocheted a single 3 dc cluster, and measured how much yarn that ate up. Then I took that measurement and multiplied by the number of granny stitch clusters I was going to have to make. So for example, if one granny stitch cluster took up 1 ft of yarn, and a full right-side up triangle has 78 triangles, I know I would need at least 78 feet of yarn, with plenty of extra just in case. I tended to use the full skeins for the large triangles and cut bobbins for the half-triangles, since they only use between 30-40 granny stitch clusters. I found that for a project this big, it was easier to use the Modular Bobbin Holder to stay organized versus winding my bobbins on clothespins as I did for my Argyle cowl. 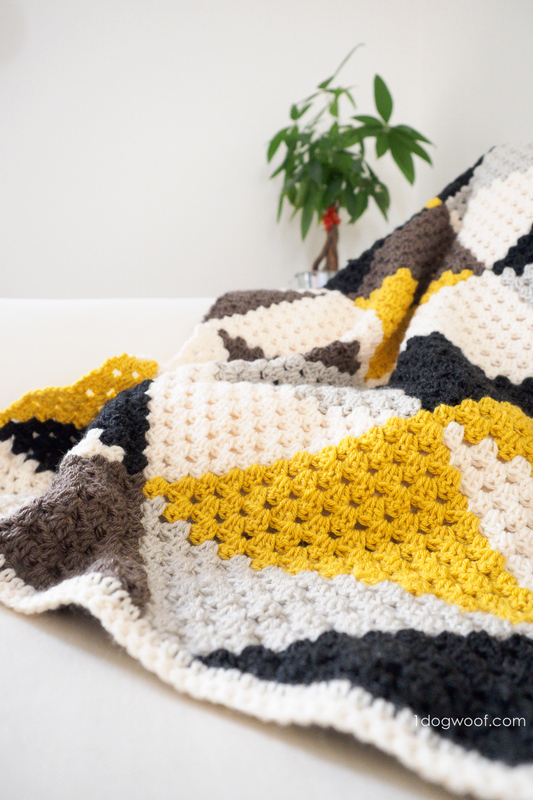 In the pattern below, I’ve shared the graph, a full photo of the finished blanket, and written instructions for the first two blocks of triangles. The pattern then repeats with different color changes that you can see in the graph. 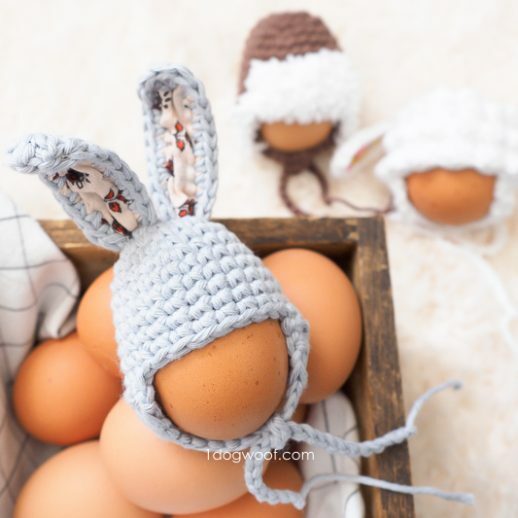 If you’d like to have all the written instructions, or prefer a printable copy with no comment and no ads, you can purchase an inexpensive PDF from my pattern shops. You can find my Granny Square Top there too! Now, who wants to win some yarn?! I’m so excited to be working alongside some of my favorite ladies and the collective creative is mind-boggling (mind-blogging?!) Make sure to check out their projects and enter the Rafflecopter giveaway below to win all the yarn needed to make all. the. projects. The giveaway is open to residents in US and Canada, and will close Friday night at 11:59pm EST. No purchase necessary. sp (space) – indicates space between the 3dc clusters. sk – skip st. Do not work a chain over the skipped stitch. gr st (granny stitch) – Work 3 dc in space between the 3dc clusters from previous row. Gauge: Each 3 dc cluster is approximately 3/4 in square. You can cut bobbins for each triangle, or have multiple skeins in active use. 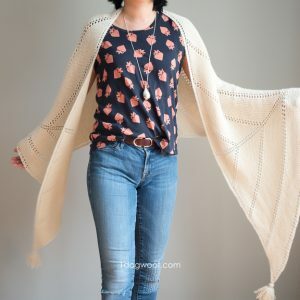 One method to figure out the yarn needed for a bobbin is to measure the amount of yarn needed for a single granny stitch, then multiply that by the number of granny stitches in any particular half or whole triangle, while leaving a large margin of error. Row 1: (in FISHERMAN) Work 109 foundation dc. Turn. Row 2: (in FISHERMAN) Ch 3. Work dc in same st. Work [sk 2, 3 dc in next st] 5x. (in MUSTARD) Work [sk 2, 3 dc in next st]. (in DARK GREY HEATHER) Work [sk 2, 3 dc in next st] 11x. (in LINEN) Work [sk 2, 3 dc in next st]. (in FISHERMAN) Work [sk 2, 3 dc in next st] 11x. (in TAUPE) Work [sk 2, 3 dc in next st]. (in FISHERMAN) Work [sk 2, 3 dc in next st] 5x. Sk 2.Work 2 dc in last st. Turn. Row 3: (in FISHERMAN) Ch 3. Work 5 gr st. (in TAUPE) Work 2 gr st. (in FISHERMAN) Work 10 gr st. (in LINEN) Work 2 gr st. (in DARK GREY HEATHER) Work 10 gr st. (in MUSTARD) Work 2 gr st. (in FISHERMAN) Work 5 gr st. Work 1 dc in 3rd ch of previous row. Turn. Row 4: (in FISHERMAN) Ch 3. Work dc in same st. Work 4 gr st. (in MUSTARD) Work 3 gr st. (in DARK GREY HEATHER) Work 9 gr st. (in LINEN) Work 3 gr st. (in FISHERMAN) Work 9 gr st. (in TAUPE) Work 3 gr st. (in FISHERMAN) Work 4 gr st. Work 2 dc in last sp. Turn. Row 5: (in FISHERMAN) Ch 3. Work 4 gr st. (in TAUPE) Work 4 gr st. (in FISHERMAN) Work 8 gr st. (in LINEN) Work 4 gr st. (in DARK GREY HEATHER) Work 8 gr st. (in MUSTARD) Work 4 gr st. (in FISHERMAN) Work 4 gr st. Work 1 dc in 3rd ch of previous row. Turn. Row 6: (in FISHERMAN) Ch 3. Work dc in same st. Work 3 gr st. (in MUSTARD) Work 5 gr st. (in DARK GREY HEATHER) Work 7 gr st. (in LINEN) Work 5 gr st. (in FISHERMAN) Work 7 gr st. (in TAUPE) Work 5 gr st. (in FISHERMAN) Work 3 gr st. Work 2 dc in last sp. Turn. Row 7: (in FISHERMAN) Ch 3. Work 3 gr st. (in TAUPE) Work 6 gr st. (in FISHERMAN) Work 6 gr st. (in LINEN) Work 6 gr st. (in DARK GREY HEATHER) Work 6 gr st. (in MUSTARD) Work 6 gr st. (in FISHERMAN) Work 3 gr st. Work 1 dc in 3rd ch of previous row. Turn. Row 8: (in FISHERMAN) Ch 3. Work dc in same st. Work 2 gr st. (in MUSTARD) Work 7 gr st. (in DARK GREY HEATHER) Work 5 gr st. (in LINEN) Work 7 gr st. (in FISHERMAN) Work 5 gr st. (in TAUPE) Work 7 gr st. (in FISHERMAN) Work 2 gr st. Work 2 dc in last sp. Turn. Row 9: (in FISHERMAN) Ch 3. Work 2 gr st. (in TAUPE) Work 8 gr st. (in FISHERMAN) Work 4 gr st. (in LINEN) Work 8 gr st. (in DARK GREY HEATHER) Work 4 gr st. (in MUSTARD) Work 8 gr st. (in FISHERMAN) Work 2 gr st. Work 1 dc in 3rd ch of previous row. Turn. Row 10: (in FISHERMAN) Ch 3. Work dc in same st. Work 1 gr st. (in MUSTARD) Work 9 gr st. (in DARK GREY HEATHER) Work 3 gr st. (in LINEN) Work 9 gr st. (in FISHERMAN) Work 3 gr st. (in TAUPE) Work 9 gr st. (in FISHERMAN) Work 1 gr st. Work 2 dc in last sp. Turn. Row 11: (in FISHERMAN) Ch 3. Work 1 gr st. (in TAUPE) Work 10 gr st. (in FISHERMAN) Work 2 gr st. (in LINEN) Work 10 gr st. (in DARK GREY HEATHER) Work 2 gr st. (in MUSTARD) Work 10 gr st. (in FISHERMAN) Work 1 gr st. Work 1 dc in 3rd ch of previous row. Turn. Row 12: (in FISHERMAN) Ch 3. Work dc in same st. (in MUSTARD) Work 11 gr st. (in DARK GREY HEATHER) Work 1 gr st. (in LINEN) Work 11 gr st. (in FISHERMAN) Work 1 gr st. (in TAUPE) Work 11 gr st. (in FISHERMAN) Work 2 dc in last sp. Turn. Row 13: (in FISHERMAN) Ch 3. (in TAUPE) Work 12 gr st. (in LINEN) Work 12 gr st. (in MUSTARD) Work 12 gr st. (in FISHERMAN) Work 1 dc in 3rd ch of previous row. Turn. Row 14: (in FISHERMAN) Ch 3. Work dc in same st. (in DARK GREY HEATHER) Work 11 gr st. (in TAUPE) Work 1 gr st. (in FISHERMAN) Work 11 gr st. (in DARK GREY HEATHER) Work 1 gr st. (in MUSTARD) Work 11 gr st. (in LINEN) Work 2 dc in last sp. Turn. Row 15: (in LINEN) Ch 3. Work 1 gr st. (in MUSTARD) Work 10 gr st. (in DARK GREY HEATHER) Work 2 gr st. (in FISHERMAN) Work 10 gr st. (in TAUPE) Work 2 gr st. (in DARK GREY HEATHER) Work 10 gr st. (in FISHERMAN) Work 1 gr st. Work 1 dc in 3rd ch of previous row. Turn. Row 16: (in FISHERMAN) Ch 3. Work dc in same st. Work 1 gr st. (in DARK GREY HEATHER) Work 9 gr st. (in TAUPE) Work 3 gr st. (in FISHERMAN) Work 9 gr st. (in DARK GREY HEATHER) Work 3 gr st. (in MUSTARD) Work 9 gr st. (in LINEN) Work 1 gr st. Work 2 dc in last sp. Turn. Row 17: (in LINEN) Ch 3. Work 2 gr st. (in MUSTARD) Work 8 gr st. (in DARK GREY HEATHER) Work 4 gr st. (in FISHERMAN) Work 8 gr st. (in TAUPE) Work 4 gr st. (in DARK GREY HEATHER) Work 8 gr st. (in FISHERMAN) Work 2 gr st. Work 1 dc in 3rd ch of previous row. Turn. Row 18: (in FISHERMAN) Ch 3. Work dc in same st. Work 2 gr st. (in DARK GREY HEATHER) Work 7 gr st. (in TAUPE) Work 5 gr st. (in FISHERMAN) Work 7 gr st. (in DARK GREY HEATHER) Work 5 gr st. (in MUSTARD) Work 7 gr st. (in LINEN) Work 2 gr st. Work 2 dc in last sp. Turn. Row 19: (in LINEN) Ch 3. Work 3 gr st. (in MUSTARD) Work 6 gr st. (in DARK GREY HEATHER) Work 6 gr st. (in FISHERMAN) Work 6 gr st. (in TAUPE) Work 6 gr st. (in DARK GREY HEATHER) Work 6 gr st. (in FISHERMAN) Work 3 gr st. Work 1 dc in 3rd ch of previous row. Turn. Row 20: (in FISHERMAN) Ch 3. Work dc in same st. Work 3 gr st. (in DARK GREY HEATHER) Work 5 gr st. (in TAUPE) Work 7 gr st. (in FISHERMAN) Work 5 gr st. (in DARK GREY HEATHER) Work 7 gr st. (in MUSTARD) Work 5 gr st. (in LINEN) Work 3 gr st. Work 2 dc in last sp. Turn. Row 21: (in LINEN) Ch 3. Work 4 gr st. (in MUSTARD) Work 4 gr st. (in DARK GREY HEATHER) Work 8 gr st. (in FISHERMAN) Work 4 gr st. (in TAUPE) Work 8 gr st. (in DARK GREY HEATHER) Work 4 gr st. (in FISHERMAN) Work 4 gr st. Work 1 dc in 3rd ch of previous row. Turn. Row 22: (in FISHERMAN) Ch 3. Work dc in same st. Work 4 gr st. (in DARK GREY HEATHER) Work 3 gr st. (in TAUPE) Work 9 gr st. (in FISHERMAN) Work 3 gr st. (in DARK GREY HEATHER) Work 9 gr st. (in MUSTARD) Work 3 gr st. (in LINEN) Work 4 gr st. Work 2 dc in last sp. Turn. Row 23: (in LINEN) Ch 3. Work 5 gr st. (in MUSTARD) Work 2 gr st. (in DARK GREY HEATHER) Work 10 gr st. (in FISHERMAN) Work 2 gr st. (in TAUPE) Work 10 gr st. (in DARK GREY HEATHER) Work 2 gr st. (in FISHERMAN) Work 5 gr st. Work 1 dc in 3rd ch of previous row. Turn. Row 24: (in FISHERMAN) Ch 3. Work dc in same st. Work 5 gr st. (in DARK GREY HEATHER) Work 1 gr st. (in TAUPE) Work 11 gr st. (in FISHERMAN) Work 1 gr st. (in DARK GREY HEATHER) Work 11 gr st. (in MUSTARD) Work 1 gr st. (in LINEN) Work 5 gr st. Work 2 dc in last sp. Turn. Row 25: (in LINEN) Ch 3. Work 6 gr st. (in DARK GREY HEATHER) Work 12 gr st. (in TAUPE) Work 12 gr st. (in FISHERMAN) Work 6 gr st. Work 1 dc in 3rd ch of previous row. Turn. Row 26-49: Repeat Rows 2-25, changing colors as indicated by the graph. For Row 26, replace [sk 2, 3 dc in next st] with the ‘gr st’. Row 73: (in FISHERMAN) Ch 3. Work 1 dc in each st across. Fasten off. 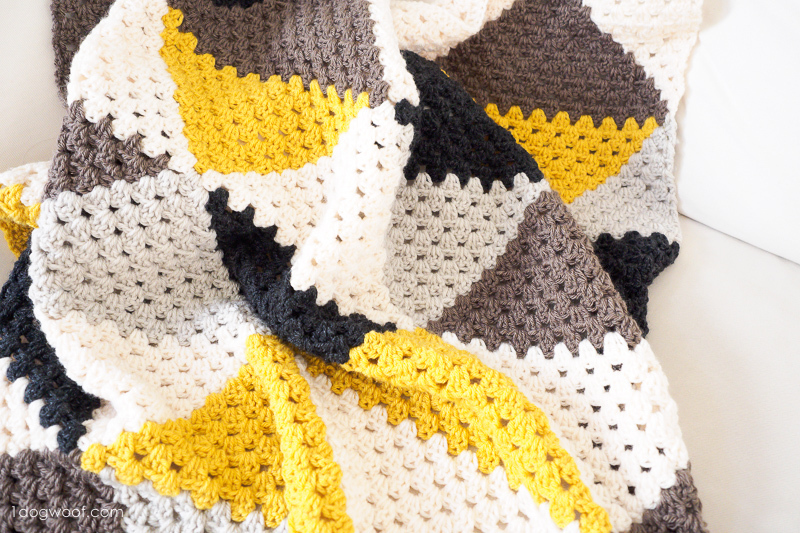 I hope my friend puts this cozy blanket to lots of use snuggling with her little one, and I hope you let your creativity soar with your own color combinations! I’d love to see all your color choices, so share your #lovetriangleafghan with me on Facebook (One Dog Woof) or Instagram (@1dogwoof)! Remember to tag your post with #1dogwoof! I love these colours with this pattern! 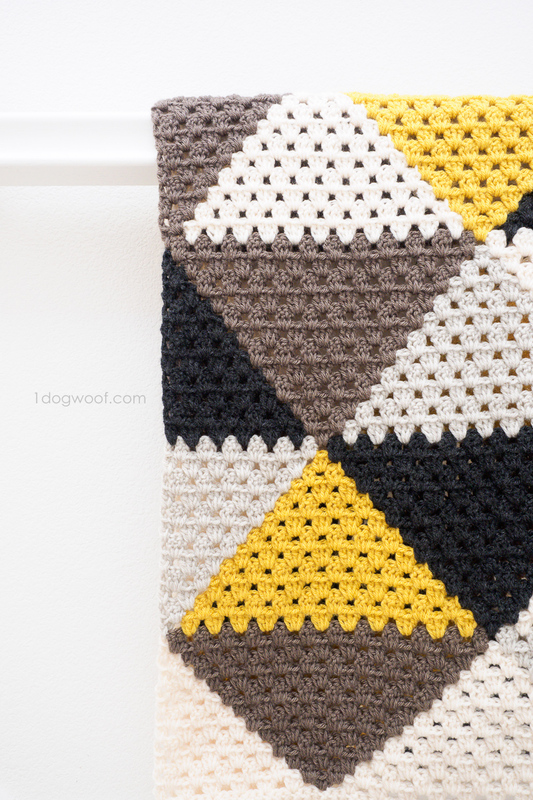 Such a cool modern baby blanket! I want to make this into a larger then baby afghan. What’s the count to increase? Did you ever find out how to make it bigger? This is what I did and it worked well for me: to increase this pattern you could use the formula 36x + 1. Alternatively you could just double the original chain count. My thinking is that since this is starting with a foundation stitch for the first row you don’t have any skipped stitches, so you wouldn’t need to take into account a turning stitch for the first row. Such a pretty afghan! Those colors are fabulous! Thank you for sharing! I love this take on a baby blanket. The colors are fresh but with a nod to the 70s I think. Fabulous! Congrats to Natalie on winning the yarn! 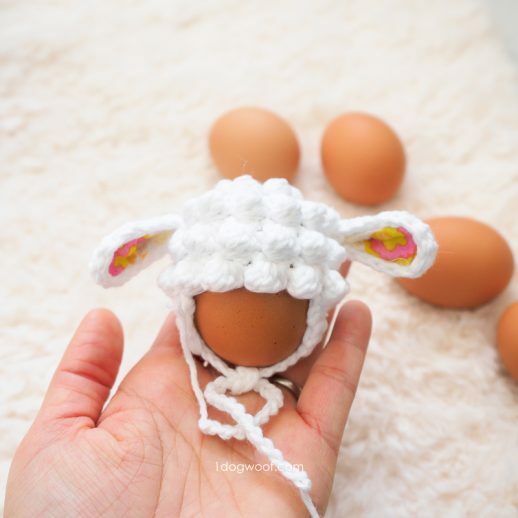 I am just in the baby steps of learning to crochet, and had the extremely good fortune of stumbling across your blog. I have loved everything you’ve created, and love how easy you’ve made it for newbies like me! Thank you for sharing your amazing talent with the rest of us! I truly appreciate the time you take in creating pictorials and simple-to-follow instructions! By the way… I think the Graph is not actually posted here, I couldn't find it…. could you maybe check it out? Love this blanket! I am almost done but I have one note to make. I wound up needing an additional skein of Fisherman. I am uncertain if it was because of the gauge of my stitches or because there are more triangles in that color than any other. It isn’t a huge issue but thought I would pass that along. This blanket is incredible! 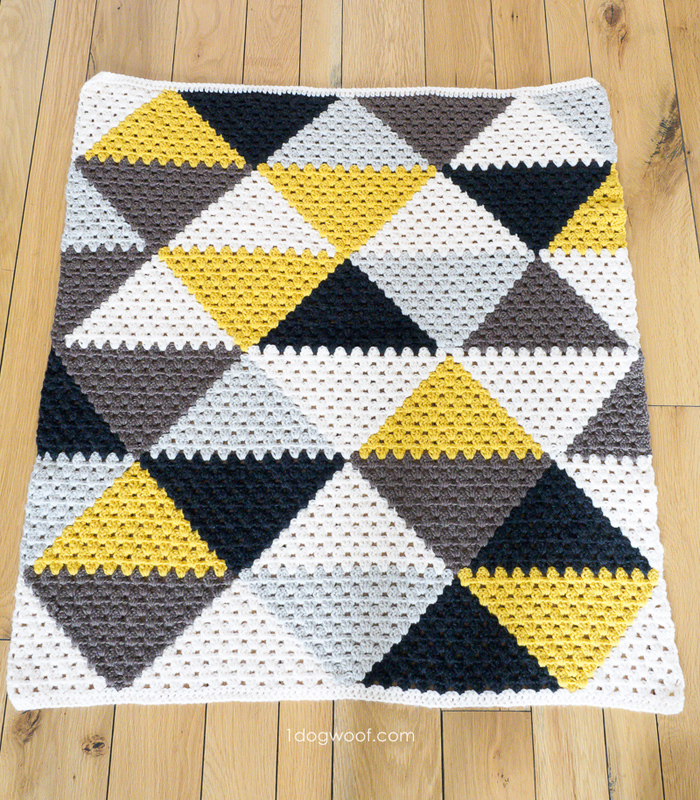 The modern colors used, the beautiful classic granny stitch pattern, and the fun, geometric look with the triangles… I just love it! This technique could be used to make so many different things! So many possibilities. 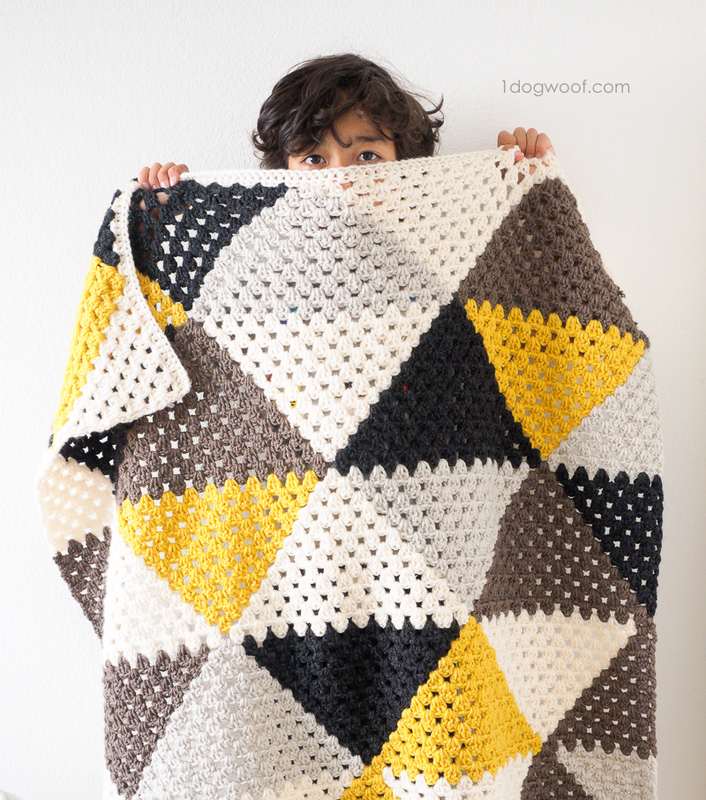 I love the pattern of the triangleblanket. Can you tell me the size of your blanket? I’d like to make a larger one.. and it will be a lot easier when I can extend yours. Hope you want to help me with this. Hi! 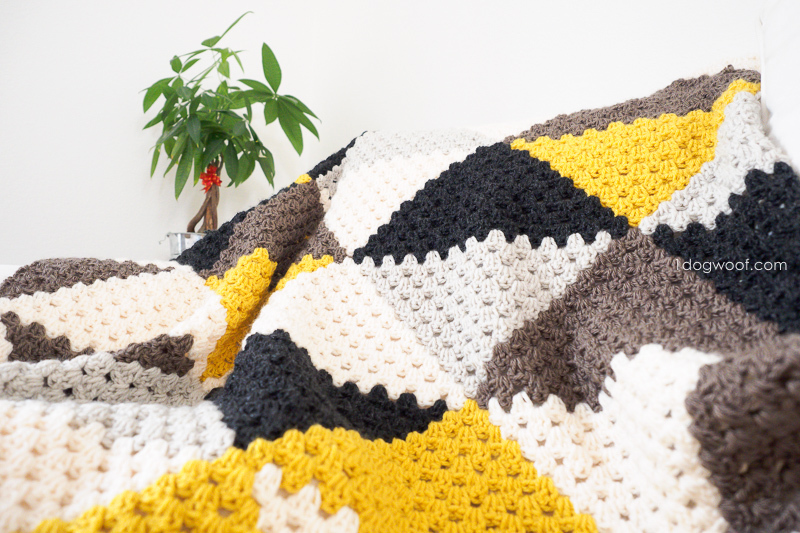 Your blanket pattern is beautiful, and I’m currently working on it and am struggling on the colour changes between rows. E.g. for row 3, when picking up the taupe yarn again, how do I use the yarn from the previous row? Is there maybe an explanation you can give or a video you can link to on this? I would really appreciate it! I would love to know to so I am following. Thank you. – I am strungleling with the color change to when picking up the yarn from the row below. Any hints on how to do this both when making at granny cluster more and when making one less? 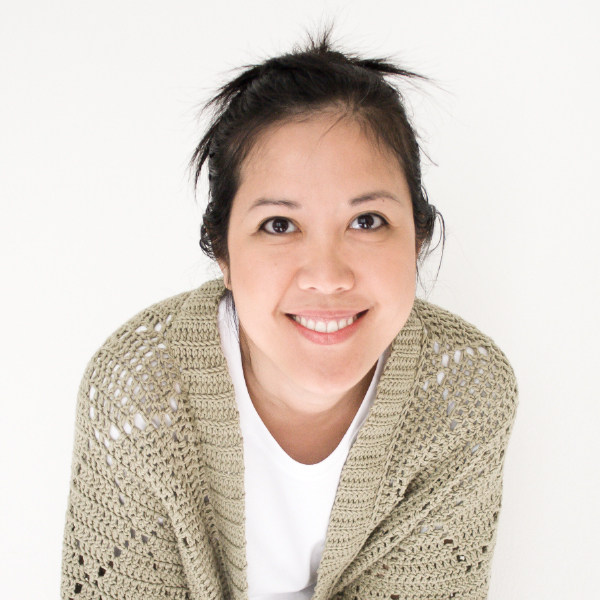 you switch yarn when you pull through the last two loops of the double crochet, on the third double crochet of the cluster. drop your current yarn after doing the first two loops then pick up the next color. Mikey is the best! Thank you for answering my question! I’m just starting and also struggling with this… I’ve watched the video several times and still am lost… any pointers? was presented with by you motivation!